For a measly 2 bucks, they lost me as a customer. In class, we cover Customer Lifetime Value – the math that captures a basic truth: businesses are better off getting repeat business from loyal customers than by gouging them on a single transaction. Apparently, Olive Garden – which used to be one of my favorite chain restaurants — missed that class. Yep, for a measly 2 bucks ($1.99 to be precise) they lost me as a customer. Here’s what soured our “relationship” …. Olive Garden (and many other restaurants) have put tablet computers on their tables. 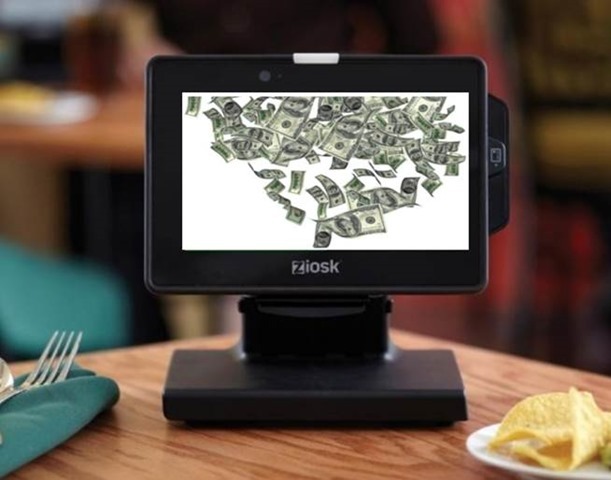 At Olive Garden they’re called Ziosks … the name of the tablets’ manufacturer. The tablets allow diners to search menus, place orders, play games and pay bills. And, they increase a restaurant’s productivity by speeding order processing (think: turning tables over more quickly) … and eliminating servers’ busy work (like taking orders). English translation: fewer employees required. When we got our bill, there was a $1.99 charge tacked on: a “table game fee”. The server said “there’s a charge for playing games on the tablet”. A member of our party got curious and leafed through the tablet’s tabs: menu, order, games, etc. She didn’t play any games. She just hit the tab to see what was up. Most important, she didn’t authorize that any charges be added to our bill. In fact, she wasn’t prompted to authorize the charge. Hit the tab, pay the price. You, see, it’s all by design … applying some classic (albeit sleazy) marketing principles. In law, there’s something called the Attractive Nuisance Doctrine. Paraphrasing, a landowner may be held liable for injuries to children trespassing on the land if the injury is caused by an object on the land that is likely to attract children. An attractive nuisance, for sure. A kid doesn’t pay the family’s dining check. So, they’re what marketers call “price insensitive” … to them, it’s a free good. Parents – who do pay the bill – are certain to be more price sensitive than their kids. They may think that the gaming fee is worth the price … or not. At Olive Garden, when you land on a premium splash screen, it looks pretty innocuous … just a menu of enticing games. There’s no message that says “ha-ha, we got you … pay up”. But, Ziosk & Olive Garden understand that inserting an authorization step would cut the “take-up rate” … since many (most?) of the “transactions” are inadvertent … not intentional. So, no authorization required … it’s in the small print, sucker. The specific “table gaming fee” – which is $1.99 — is no accident. First, it’s big enough to make a big difference to Olive Garden’s and Ziosk’s profitability. It’s one of “Homa’s Law” that a little number ($1.99) times a big number (Olive Garden customers) is still a pretty darn big number. Second, it’s small enough that most diner’s probably don’t even notice it on the bill. For those who do notice it, they may conclude that the unexpected charge was worth the price or may figure that it’s too piddly of an amount to complain. Based on online accounts, most restaurant managers who are confronted by unhappy customers plead a “George Costanza Defense”. They tell the complainant that they’re the first to raise the issue, that all other customers are thrilled by the tablets. Then, they can stonewall the charge as company policy … or fork over 2 bucks and say “I’m sorry, here’s your money and a coupon for a free app … please come back” … or defiantly hand over the money with a “get out of here” look in there eyes. I figure that we go to Olive Garden — err, make that used to go – 4 times a year at maybe $35 a pop. Call it $150 a year … or at least $2,000 for the rest of my insurance-table lifetime. Why would a company put $2,000 at risk for a measly 2 bucks? I was so psychologically scarred by incident that I Googled it, wrote this post and have already told the story a dozen times. Just the latter get’s us up to $25,000 in revenue at risk … balanced against a $2 gain. I guess that Olive Garden has concluded that it’s a good bet. My view: It’s not the 2 bucks, it’s the principle … and the obvious question that’s raised: how else are they screwing us? This entry was posted on May 9, 2017 at 6:59 am and is filed under Marketing - Shady Practices, Restaurants, Tabletop Electronic Kiosks. You can follow any responses to this entry through the RSS 2.0 feed. You can leave a response, or trackback from your own site. We found out by accident while fiddling with the tablet. I asked the waitress about it because I saw a hint that we would be charged. She said she would take it off the bill. I was outraged! I had no idea it was so easy to be charged. There was no warning at all.